Occasionally I will try to fool myself into thinking that I was originally drawn to Bikram yoga while searching for a holistic remedy for my chronically aching back, anxiety and depression, and the scoliosis that gave my shoulders a permanent tilt. However my final push to try a class was much more shallow. Several years ago, during my aunt and uncle’s annual Memorial Day party, I looked over my shoulder and saw a gorgeous woman in a two-piece bikini. My jaw dropped when I saw that the gorgeous woman was my forty-something year old mother. Her skin was glowing, her eyes were bright and clear, and her body, to put it bluntly, was rocking. I asked what she had been doing, and her response was simple: “Bikram Yoga.” The same yoga she had been encouraging me to try for the past six months. During those six months I would come up with various excuses as to why I definitely should not try a class; “I’m not flexible”, “I tried yoga once before and didn’t like it”, “I don’t like the heat”, etc. However, seeing my mom look so comfortable and free in her swimsuit, and in her own skin, was the argument that won me over. The next morning I was in my first class. It was hot and humid, and I felt gross, sweaty, and incredibly inflexible. I couldn’t even touch my toes. It was during my first class that I decided yoga was not for me. Then, an eternity later, class finally came to an end. And much to my surprise, I felt lighter: mentally and physically, and that euphoria I felt was all I needed to give Bikram Yoga another go. I was back in the hot room the following morning, and the morning after that, and the one after that. A year later I flew to Los Angeles to learn how to teach the yoga practice I fell in love with. Over three years have passed since my first class, and I am still falling in love with this practice. I may have been drawn to Bikram for a reason as simple as wanting to look better in a swimsuit, but what I got out of my yoga practice has been much more. My chronic back pain is gone, my shoulders no longer tilt, I am able to manage my anxiety and depression without the use of pharmaceutical drugs, and perhaps most importantly of all, I found something that I am able share with my mother. Thank you mom! 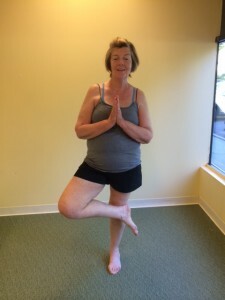 I’ve practiced yoga all over the country and Bikram Yoga Danbury is one of my favorite places to be. The teachers are wonderful and the community and people make me feel like family. I trained for and won the Connecticut Yoga Asana Championships in 2013 and I couldn’t have done it without the love, support, and awesome training that I received at BYD. It is a place that you will want to keep coming back to and a studio that holds a very special place in my heart. Highly recommended!! There are not enough things I could say about Bikram Yoga that could fully describe all of what it has done for me. I first came to Bikram Yoga at a time in my life when I was looking for stability and to work things out mentally that I could otherwise not get a hold of. I have been a sufferer of anxiety and poor body image my whole life. I was also never great at expressing my feelings. Bikram Yoga gave me a chance to do just this- it allowed me an alternative way to let out my feelings and a chance to look at myself when other things were not going the way I wanted them to. It gave me a sense of peace. Bikram Yoga continues to do that for me, as well as so many other things. Physically, it makes my body feel amazing. I still leave feeling mentally and physically renewed and rejuvenated. It awakens parts of my mind and body that I forgot were there. The effects are truly amazing. Old or young, Bikram Yoga has so much to offer the whole human body, mind, and spirit. I will forever be grateful for Bikram Yoga! I’ve been practicing for over ten years now and the list of benefits are amazing. With regular practice I find myself sleeping better, more energized and without knots in my back or chronic tendinitis in my leg that I suffer from. The times I’ve been unable to practice for long periods I find myself yearning to get back in the hot room and get back to normal! I walked into Danbury Bikram Yoga 4 years ago out of curiosity & in the hopes I will find “something” new to add to my physical routine (which was in a rut). Before my first class a few girls gave me the heads up…”Its really really hot in there…26 postures….just try to stay in the room”. I was about to get back in my car & jump on my treadmill, the usual 3 mile jog. But…I decided to stay to see what the buzz was about. I remember driving home after class (I made it through 90 minutes!) & calling my girlfriend in NYC to tell her that I did Bikram & I loved it! Now I can’t see my life without Bikram & its become a priority. It has helped all my ailments (sciatica, herniated disc & a lot of stress). Most importantly, its 90 minutes of me time meditation & a feeling of euphoria after class. Not to mention the cardio kick I need! Thank you Alina & Xavier & the Danbury Bikram Yoga family for introducing this wonderful practice into my life!! When I first came to Bikram I wanted the original owner Joy to take a photo because in 30 days – OK, maybe 6 months – I was going to be transformed. It’s now five (how many?) years later and I’m not transformed the way I thought I was going to be, but transformed I am. I am not a pretzel body – there are plenty in the studio – but I have not rusted into place either. I healed a year-long pain in my tail bone and got rid of the cushion I had to use while driving. I am healthy and much more flexible than I would be if I didn’t practice. I call the process “unpacking myself.” Sometimes, it’s sheer flexibility, sometimes it’s my breathing that is strengthened, or my circulation, sometimes it’s my will (and won’t) power, sometimes it’s my mood and spirits. Every time I practice, the postures tell me something new about my body, about my mind and, yes, about my spirit. There is always something that gets unpacked and improved. Always. I had been away from the practice for a while and when I came back Alina had taken over the studio from Joy. She has continued to make it a joyful, accepting place with a cheerful smile and acknowledgement for all who come through the door – first timers or veterans. The studio is a welcoming place. And in that atmosphere I have watched so many people thrive and improve their health and happiness. Today I have a community of friends I look forward to practicing with. It is a place where I can bring any stress and glumness and have it dissipate in the heat. Or bring a great mood and share it with one of my Bikram buddies. It is a place where I do something very important to protect all aspects of my health. So, I keep coming back. Bikram yoga is a 90-minute, moving meditation that enhances the body, mind and soul in more ways than one can imagine. I have practiced Bikram in a dozen studios located throughout the country, and am always thrilled to practice at Bikram yoga Danbury. The studio is truly amazing. It is extremely clean, the instructors are excellent, and the owners, Xavier and Alina, treat everyone as if they were family. I have been practicing at Danbury Bikram Yoga for almost ten years. I can’t begin to explain how much it has changed my life. It has made me stronger mentally, spiritually, and physically, it is like nothing else out there. As an Expectant Mother, I made the decision to continue my practice through my second pregnancy. With modifications I continued until 38 weeks and felt great! I believe the practice prepared my body for delivery, as I had less issues with water retention, and for the most part, slept great! It also helped me shed those extra 50lbs postpartum. I highly recommend Bikram Yoga for anyone looking to experience something new and worthwhile. For those who make the commitment, they’ll be no turning back, your life will be changed forever! Steve Zagami Sgt. U.S.M.C., Firefighter N.Y.F.D. , R.N. A dear friend suggested I give Bikram a try at a time in my life when the word “transition” was just beginning to take hold. She described it as 90 minutes of physical and mental focus that will change my life. Quite a statement right, I mean the physical stuff has always come easy for me, hum but this mental stuff could be good, so off I went on my motorcycle and just made the 4:30 class. Alina greeted me like she was expecting me, took my helmet, gave me a mat and pointed me to the studio. Walking into the studio for the first time was well shocking, I mean, how can I be expected to do this Bikram stuff when I can’t even breath – there is no air! Alina was patient with me as I worked hard at mastering the Savasana pose and yes that was challenging because of the “no air” thing. Nonetheless I did managed to finish that first class. On the bike ride home I knew something was different – kind of like you turned a corner and discovered a new neighborhood to explore. Fast forward 10 months now and it’s safe to say Bikram has changed my life as my friend predicted. Yes some very noticeable changes to my physical well-being. However the real power of this Bikram stuff for me is in the meditative focus it has brought into my life. You are taught to stay in the present moment for 90 minutes. How many of us can honestly say we do that for 5 minutes let alone 90? Over time it does happen, the past is just that and tomorrow is just a thought. Your breath is all that matters. As mentioned, this practice came about during the beginning of a transition – it’s really more like a Tsunami of change. The practice has taught me how to keep my head above the water, allowing for real focus and perspective on the things that matter. Alina and Xavier and everyone there has treated me like family. The instructors are great, with each one bringing something unique to the class including a sense of humor! The many lessons learned in class have become great metaphor’s for my life. I hear “you’ve got this” whenever I need to process something challenging. Even the heat is my companion now, and yes there is air in the studio – you only have to breath! When I started Bikram, voices from years of competitive sports were still echoing in my head: “Pain is good… All that matters is winning and being the best…” In Bikram I heard new voices: “Just stay in the room… The most important thing is that you breathe…” I realized that I was on a different journey here, one in which every class was not win or lose but rather a part of my “practice,” always evolving. When I don’t make it to class for awhile, I can feel it! Other workouts might be good, but they are not the same. They don’t feel complete. I miss the all in one! And at Bikram Yoga Danbury the attitude is always: “Welcome! Glad you’re here!” I feel so lucky to have this studio and this yoga! My Bikram Yoga Danury journey began the end of February 2016. I arrived with a disability that occurred while working as a Mailman for USPS for nearly 30 yrs. I injured my cervical spine and tore my right rotar cuff. I suffered incredible pain since 2003. I Had no range of motion in my neck for over 13 yrs and have had many surgical procedures on my injured cervical spine. My shoulder was repaired via surgery, but still suffered from nerve damage and severe migraines and pain from my injured cervical spine. I was also receiving trigger points every month (8 shoots on each side of my neck) for nearly 10 yrs. Was a quick fix, but pain would return within a week. Feeling depressed and my anxiety level off the charts due to my injuries, my pain doctor put me on potent pain meds. 13 years I basically stayed in my room I did not have any interaction with people outside of my family. September 2015, I took my last pain pill and haven’t looked back since. Although I was still in pain, I felt better mentally. 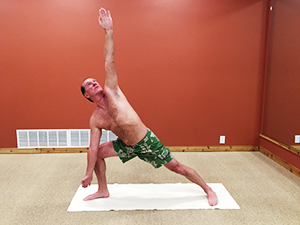 January 2016 a long-time friend of mine from GrammaSchool, whom I haven’t seen in over 35 yrs, Steve Zagami told me about Bikram Yoga Danbury. Knowing what he has been through he told me this practice has changed his life. I told him I would be willing to try anything to alleviate my pain, anxiety and depression due to my injuries. On the last Sunday in February 2016, I walked into Danbury Bikram Yoga Studio, was greeted by Steve and other members of the studio. They all made me feel right at home. Bikram Yoga Danbury has been life changing for me. After 2 months of going 4-5 times a week, I had an appointed with my pain Dr. and was scheduled for 16 painful trigger points that day. At my Drs. amazement, he Couldn’t believe I had Almost 100% range of motion in my neck. He asked me what I was doing different. I told him Bikram Yoga, this is now part of my treatment plan,in place of the trigger shots. Not only has Bikram help control my pain, but it also brought down my blood pressure,cholesterol level, anxiety,depression and also help my sinus problem. My family notice a change in me after a month of practicing Bikram, I was 100% more relaxed and extremely calm. This has come from the knowledge of the instructors teaching me how to breathe and meditate. It has actually helps me sleep better at night time. For 13 years I have had very little sleep at night due to my injuries. I can’t imagine where I would be if I didn’t have Bikram Yoga in my life. I feel alive again and been socializing once again. The Bikram Yoga Danbury Studio not only has the best members but we have the best owners in Xavier and Alina Gomez. They both make you fell right at home and care about each and everyone of us. The studio is top notch with the best instructors and is extremely clean. If you haven’t tried Bikram Yoga Danbury, then you are cheating yourself. It is the most challenging workout that I have done in my life. Harder then when I trained for baseball and basketball in high school and college. Spending 90 minutes in a room that is 105 degrees and doing 26 postures, is very rewarding at the end of every class. I will continue to go to the Bikram Yoga, because I am a firm believer that this is keeping me out of the operating-room. Thank you Steve for turning me on to this incredible practice. My name is Midhat Serbagi. I’m 86 years old. I was a member of the Metropolitan Opera Orchestra for 37 years and am now director and performer with Friends of Classical Music in Carmel, New York. You know when you get older you begin to slow down, things become more difficult to do. Your mind and your body do not work the way they did when you were 25 or so. However, I refused to accept that old-age stuff. 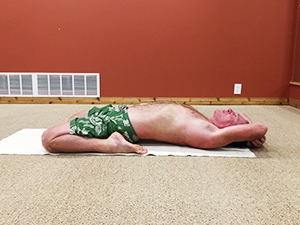 I decided that perhaps Bikram yoga would help to slow down the physical and mental recession. Shazam!!! It works!!! True, I don’t feel like I’m 25, but my body and mind are working. I play golf, I walk and sometimes carry my clubs. I move better, I think better, I play better and it have been to only eight sessions. True, Bikram yoga is hard work and I become impatient with it, but it does the job. The teachers here know what they are doing. Try it. You’ll see.